Whew! Ok, this was a challenge only in finding the time and brain energy to make and post this recipe. This month’s challenge was the make any style of pasta/noodle without the use of motorized tools. I have always wanted to make pasta, so needless to say, I was very excited about this challenge. A few months ago, my husband and I joined our friends, to celebrate a birthday at a German restaurant. I had never been to a German restaurant and not being a big fan of sausages, did not find the majority of the food appealing. I did try a few dishes that were absolutely delicious (non-sausage), so I would not give up on German food yet. One of the dishes I did try was buttered Spaetzle. Oh My God! It was awesome. Such a simple dish of noodles with butter but the flavor and texture was wonderful. It is a type of egg noodle that is more like a mini dumpling than a noodle. I have seen many recipes and it takes many different shapes. Since then, I have been wanting to go back to that restaurant, only to have more of this dish. This challenge was the perfect opportunity to make it myself. What did I find? It was incredibly easy to make and very quick. I am definitely making this again. 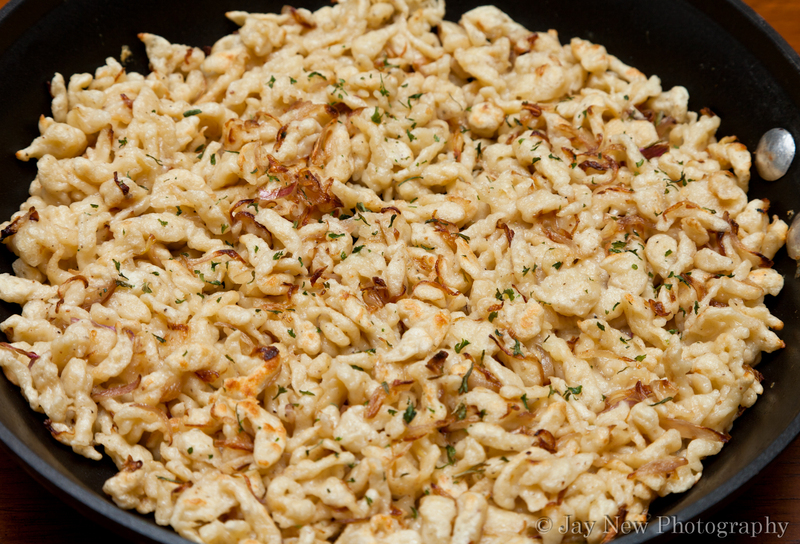 For my challenge I made Gruyère Spaetzle with Caramelized Shallots. I adapted a recipe from The Food Network. Dried or chopped parsley, to garnish. Combine flour, salt, pepper, nutmeg, eggs and milk and mix until well blended. You should have a pourable but not too thin batter. Allow batter to rest for 10-15 minutes. In the meantime, caramelize shallots, in a large pan, with 1 1/2 tablespoons of butter and set aside. If pot of water is boiling, lower the temperature to a simmer. To make spaetzle, hold a colander or food mill over the pot of simmering water. Place a portion of batter into the colander and with a spoon (of handle), scrap the batter through the holes in the colander. This will make small long bits of batter. When the spaetzle is floating in the water (give it a stir so it doesn’t stick to the bottom of the pot) remove and run under cold water to stop the cooking process. Turn on the stove to medium and stirring every few minutes, brown the spaetzle. When the spaetzle is brown to your liking, lower heat and add your cheese, mixing well. I would especially like to thank Steph from Stephfood for hosting this challenge. It was a wonderful challenge and my family really enjoyed it. Thank you very much! I’m intimidated by the thought of making my own fresh pasta, but you make it look easy! I’ll have to try doing it soon. I never had made my own pasta as well and wanted to try it sometime. That recipe of yours looks so yummy. Ohhhh, I think I could eat that whole pan!